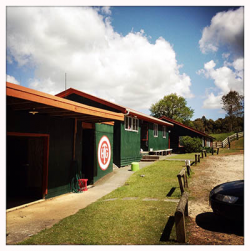 Buildings: The club hut is split into two buildings, a "dorm block" and main building with kitchen and lounge. There is also a large covered area for getting changed out of caving gear and storing / drying equipment. 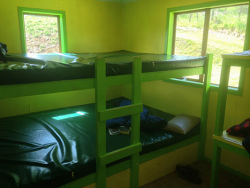 Accomodation: The dorm block is split into seven bunk rooms comfortably sleeping about 30-40 people; Sleeping facilities are all contained in the dorm block. 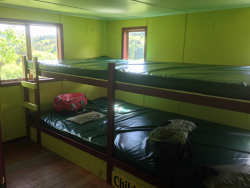 Some bunks are sleeping platforms that allow a width of 70 centimeters per person. Children may require a little less. Main Bunk Room: Contains a double height sleeping platform style bunk which accommodates 6-7 adults per level or 14 in total for the room. Smaller Bunk Room: Contains a narrower double height sleeping platform which accommodates 4-5 adults per level or 10 in total for the room. Five smaller rooms accommodate up to 14 people in single bunks. No bedding is provided all are just bare bunks. Bring bedding, pillow and sleeping bag. Toilet and bathroom facilities: consist of 2 showers and 1 toilet in the dorm block. With a further 2 showers and 2 toilets at the other end of the building ideal for showering after caving etc. Toilet rolls, and cleaning equipment are provided. Cooking: The kitchen has two electric stoves, and all utensils, cutlery, crockery (It is however mismatched and procured by donation or from op shops. ), and a zip/water heater. Living Areas: Lounge, dining room and outside BBQ area and deck. There is a large room containing wood-burning stove and a range of re-cycled couches and chairs for relaxing in. Along with two large tables adjacent to the kitchen for meals. There are USB charging points for 'phones and tablets in all areas of the accommodation. Summer / Onsite Warden: During Summer season the Lodge may have a hut warden and is run in a similar manner to a DOC Hut. But if there is no warden or they are not around the hut will be locked up, so make sure you have the key code before you arrive. This comes in the booking confirmation email. Autum/Winter/Spring: The hut is usually locked and does not usually have a warden, you will need the key code which is sent to you on confirmation of the booking. Club Members / Exclusive Booking: The Hut cannot be exclusively booked out; it has an “open door” policy for members and is used by various caving groups especially on weekends. However it is seldom occupied on weekdays. The booking process is a two step process, once you have selected your dates and numbers press 'Book' and a request will be sent to club members. We will try to process it in 24hrs. or so. Once we have done that you recieve a booking confirmation with acess codes included. We will also send you an automated email 7 days before you arrive if you have booked ahead. That way you get any updated key codes. Individual bookings: are in cash only paid when you arrive into the "honesty box" in the main room next to the entrance. Instructions are in the hut. Group & School Bookings: These can be paid by direct debit after your stay, let us know on the booking form if you need an invoice. Payment is in CASH ONLY when you arrive and sign in. You will need to bring the correct money. There are payment envelopes on the desk beside the cupboard. Fill in the envelope and post it into the cash box beside the desk. There may not be a resident Hut Warden. You will need all your own bedding. The hut DOES NOT have WIFI, its a "hut !! ", but it does have good cell phone reception. Make sure you have your KEY CODE from the confirmation email before you arrive. The hut can hold up to 40 people but groups need to be aware of the toilet and shower numbers, which may be limiting for some groups. Payment by direct credit and issue of invoice is possible by arrangement in advance, please let us know how you intend to pay when you book. As mentioned above the hut cannot be booked exclusively as club members do use the place, mainly at weekends. Groups will need to bring their own bedding as all the hut has are mattresses. The hut is basic accommodation more akin to a DOC hut than a modern backpackers. The hut can hold up to 40 people, but groups need to be aware of the toilet and shower numbers, which may be limiting for some groups. As mentioned above the hut cannot be booked exclusively as club members do use the place, mainly at weekends. For bookings during the week arrangements can be made for schools to minimize the number of other guests. Please mention this in your booking comments section and we will get in touch. Schools will need to bring their own bedding as all the hut has is mattresses.